October 24, 2012 at 12:03a.m. Colleen Eisenbraun, program manager of Making Kids Count, starts a third-grade tutoring session at Struthers Elementary by reading from “Frindle” by Andrew Clements. Two students sat across from each other in the art room at Struthers Elementary School on Tuesday and contemplated the task before them. They had just been given new notebooks by their new tutor, Jana Coffin of an organization called Making Kids Count. Now, they were going to do some recall work about a story they and 20 of their classmates had just heard. First things first, Coffin said: They should date the top of the page. The notebooks, she said, are going to be a journal for them for their tutoring sessions that began Tuesday and will continue through May. They began to write as Coffin asked them to remember aspects of “Frindle” by Andrew Clements, a story about the scholastic adventures of a very creative “troublemaker” named Nick Allen. If there are three lists, the book begins, of really bad, smart or good kids, Nick would not be on any of them. “He deserved a list all his own,” read Colleen Eisenbraun, Making Kids Count’s program manager. “Let’s talk a little bit about the setting,” said Coffin. “It takes place in a school,” one of her charges volunteered. “Let’s put the word setting in there,” Coffin suggested. “The setting takes place in school,” the two of them wrote. “What do we do at the end of our sentence?” Coffin asked her other charge, who promptly placed a period after it. “Good job!” Coffin said, as throughout the room, tutors that included Making Kids Count employees, Struthers High School National Honor Society members and Youngstown State University education majors coached their own groups of two to three students. 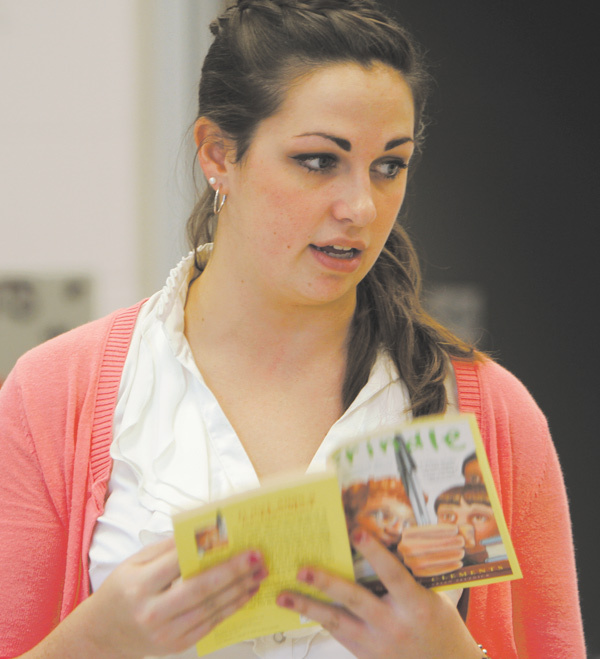 Making Kids Count, which began as a nonprofit organization with programs for children in 2010, asked if Struthers Elementary would be interested in tutoring sessions at just the right time, said Maggie Kowach, the school’s principal. A new state law has implemented the Third Grade Reading Guarantee, which requires all students from kindergarten through third grade to be reading at least at grade level or they will be retained in third grade, she said. Though the school has programs for kindergarten through second grade, there was a need for tutoring for third-graders, Kowach said. “I said, ‘If we have this opportunity, let’s use it to meet the requirements of the Third Grade Guarantee,’” she said. Tutors from Making Kids Count will help third- graders with reading and math on Tuesdays and will coach fourth-graders in those subjects on Wednesdays. Nick, the protagonist in “Frindle,” is special. Making Kids Count believes every child deserves to feel that way, said Eisenbraun. The small organization based in Boardman also gives birthday parties for children in temporary housing and at Akron Children’s Hospital of the Mahoning Valley, provides supplies for newborns whose parents need financial support and runs a diaper bank that distributes 2,000 diapers a month. The group has begun an art program for kindergartners at Market Street Elementary School in Boardman, and it partnered with Donnell Ford of Boardman to host a Fall Fest, Thanksgiving dinner and to provide Christmas gifts for students at Williamson Elementary School in Youngstown. The group subsists on private donations, which can be made at its website, www.makingkidscount.org, or send a check to Making Kids Count, 7178 West Blvd., Suite E, Boardman, OH 44512. November 9, 2013 12:01 a.m.
October 9, 2013 12:05 a.m.
September 8, 2013 12:04 a.m.
January 21, 2012 12:02 a.m.